My daughter has her own “garden”, which amounts to a flower bed in front of our house. We used to press flowers in a large art books with wax paper to protect the pages, but when I saw Root Children Flower Press, I thought she might enjoy pressing flowers without adult assistance. 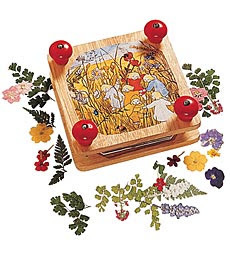 The Root Children Flower Press is a nice way for children to preserve a little bit of nature for their own pleasure. The Root Children Flower Press comes with cardboard to place between flowers when pressing. The large red knobs are perfect for smaller hands and are great for fine motor practice. They also provide a hands-on method for learning which way to turn a screw to tighten or loosen it, without needing to hold onto a screwdriver. Instructions are included with the Root Children Flower Press, which give great tips for what types of flora and fauna works best for pressing. Like many young children, my daughter has to learn her lessons herself, so she has experimented with rose buds and other flowers that are not recommended. Once your child has pressed flowers or greenery, there are many great projects for the flowers. Making greeting cards or simply slipping the dried flower into an envelope with a note makes a pleasant surprise for grandparents and distant friends. My daughter has also made a bookmark with her dried flowers. I really like the Root Children Flower Press, and it is a natural “toy” that lets your child interact with nature while playing it. The dried flowers also promote their creativity. This is a great product! We have one too!